Look! Over in the toy aisle! It's... well, nothing, really, because this figure was pretty much an instant sell-out everywhere. Let's be honest: Superman wasn't a very good movie. The story is mediocre, the script is ridiculous, the acting is hammy, and the effects aren't very special. It might have been fine when it first hit theaters, but rather than aging like a fine wine in a cask, it aged like old potato salad in the sun. It's beloved for the same reason we like the original trilogy so much more than the prequels - namely, you're less judgemental of things you're exposed to as a child. 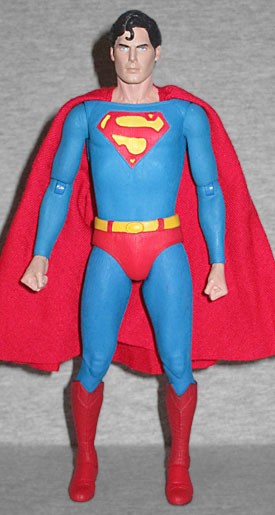 But quality aside, there's no denying it's iconic, so when NECA announces they're releasing a 7" scale Christopher Reeve Superman, that's going to be one to get. 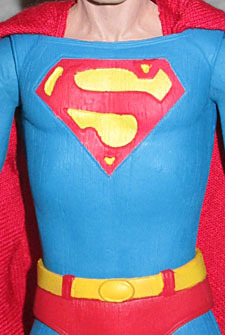 Mattel released a Christopher Reeve Superman, but as you might expect, it was complete garbage. The body was too muscular, the shield was the wrong size, and the likeness was horrendous. Seriously, it was like a Funko ReAction figure, and those are so genericized that they don't even require likeness rights to make. This one, however, sports a face that isn't quite as good as Joker or Batman (either Batman), but can still easily be recognized as Christopher Reeve. 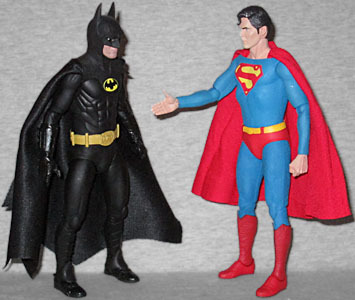 Like the other NECA DC "miracle" releases, this began life as a quarter-scale figure - it's an 18"er scaled down to a more purchasable format, and sold directly by Warner Brothers rather than NECA (which is why fans refer to them as miracles: NECA can't make DC Comics figures in this scale, so the stars have to align for it to happen). The original was sculpted by Kyle Windrix and Adrienne Smith, and the details still look great at 40% the size. There's a vertical ribbed pattern sculpted into the "cloth" of his costume, and the S shield has sculpted edges - the right choice, since the screen costume's shield was an insert, not just a patch or screenprinting. There are numerous small wrinkles on his boots, suggesting they're made from a thicker material. 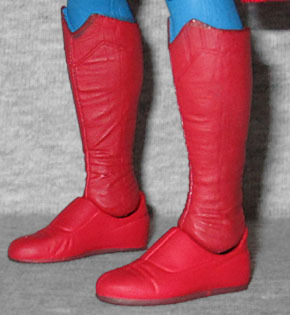 Which is the truth: the suit and trunks were made from bridal-weight spandex, while the boots were made from glove leather. The chest of the toy is actually a rubber shell over the physical body beneath. Why would they do it this way, instead of just sculpting a normal torso? Because of the cape. Reeve's gabardine cape tucked in under the edge of the tunic, and there's no way to fake that in a sculpt: if you want a cape to go under a shirt, the cape has to go under the shirt. It's softgoods, but a nice thick material that feels better than Batman's. Either Batman's. The S-shield on the back is an applique, as it was in the film. That construction does present one minor issue, though: the rubber chest can stick to the rubber trunks, leaving a little bit of paint transfer when you separate them. But again, this is minor. It isn't something that should ruin your enjoyment of the figure. The S is a little off-target on mine, but the sculpted edges help with that. Also, the mustard yellow of his belt spills onto the belt loops slightly. 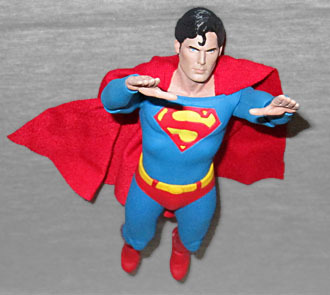 Superman's only accessories are a pair of flat hands, presumably for flying poses (though he more commonly flew with his fists in front of him). The figure moves at the ankles, knees, thighs, hips, waist, wrists, elbows, shoulders and neck. As mentioned, the shirt and trunks were initially stuck together, so the upper body was restricted, but gently separating them fixed that problem. Worse was that his left knee sheared off immediately upon removing the figure from the tray - that's going to require help from customer service to take care of. 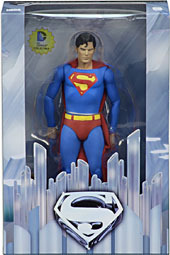 Like the two figures he was released alongside, Superman comes in a stylish 8⅜" x 5⅝" x 2¼" box. It's light blue, depicting the movie's version of the Fortress of Solitude, with its weird crystal tubes. The insert shows the same thing, making a fun little diorama for the figure. If NECA ever gets to make Ursa, Non and Zod, this would be a great place for Superman to murder them. Because remember, that's what happens in the sequel: Superman murders them. Well, to be fair, he only personally murders Zod - he just lets Non fall to his death, and smiles and stands by as he passively watches Lois murder Ursa. But by all means, keep crying about how "wrong" Man of Steel was, fanboys. I may not care for Superman as a movie (or for Christopher Reeve as Superman), but that doesn't mean this toy isn't worth getting. Like we've said before, even if figures are in the wrong scale, get enough of them and they start to look right. There are now four 7" NECA DC figures, which means that they can form their own little clique apart from the Mattels and DC Directs of the world. You can stage the Reeve/Keaton World's Finest crossover we never got in real life, and that's just a slice of pure awesome.